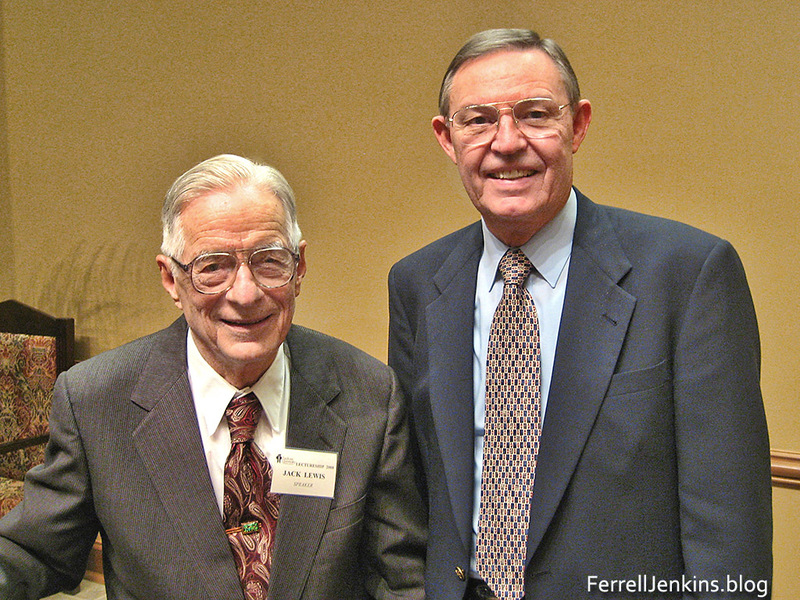 We note the death of Dr. Jack Pearl Lewis earlier this week on July 24th. The name Jack Pearl Lewis will be unknown to many readers of this blog. Others will recognize his name and his work. I write here because he was an outstanding biblical scholar who played a part in my travel experiences. Lewis was a founding faculty member at the Harding Graduate School of Religion in Memphis, now known as Harding School of Theology. At the time of his retirement he was named Professor Emeritus. Among several good teachers that I had, Lewis was unique. He held two earned doctorates, a Ph.D. in New Testament from Harvard, and a Ph.D. in Old Testament from Hebrew Union. He was the most demanding teacher I had, and one of a few from whom I learned the most. After the high school years at Athens Bible School, and four years of Bible at Florida Christian College (now Florida College), with teachers such as Homer Hailey and Franklin T. Puckett, I had a good general knowledge of the Bible. I think I had about 60 hours of Bible at FCC. I had added about seven years in full-time preaching before attending the Graduate School. The graduate work was not too difficult, it was just on a more demanding advanced level. Dr. Lewis was always available to talk with if you could locate him among all of the books in his office. It was part of the graduate program generally, but Lewis taught the importance of using primary sources where possible and the importance of thorough preparation. He entered the class room, called the roll, and began lecturing. As a student I made notes the best I could, then spent hours after each class verifying the names, dates, and facts presented. Different from the students I had in college, we would never imagine asking “How do you spell that?” He taught us the importance of using up-to-date sources in our research. Jack Lewis was my first teacher who had spent a considerable amount of time studying the land of the Bible. He had worked in the archaeological excavation at Arad, and had spent a year as a fellow at the American Schools of Oriental Research in Jerusalem (now the Albright Institute). In one of the classes with Dr. Lewis I did a paper on “Authentic First Century Remains in Palestine.” Soon afterward I began to prepare for my own visit to the Bible lands. I might have gone anyway, but I must credit Dr. Lewis, and his unique insight into the land of the Bible, for spurring my interest in traveling to this part of the world. The last time I visited with him was March 6, 2008, at Faulkner University where he made a couple of presentations and was honored for his work. As we visited, he said something like this: “There is nothing as valuable as seeing the places you study about.” So, now you know one of the major motivations in my travels to Bible lands over all these years since the first trip in 1967. I still learn on every trip, and in the preparation for the trip. Dr. Lewis was a prolific writer. His many books included The History of the English Bible from the KJV to the NIV, The Interpretation of Noah and the Flood in Jewish and Christian Literature, Historical Backgrounds to Bible People, and a two-volume commentary on the Gospel of Matthew. There are also books on the prophets and other areas of biblical studies. One of the lectures given by Dr. Lewis at Faulkner University was on “The Battle for the Integrity of the Bible.” In his typical rapid-fire manner, he surveyed the battles that have been won in demonstrating the integrity of the Bible. It was just a survey, but he seemed as sharp as in those classes on The History of the English Bible and on Archaeology and the Bible from which I profited so much. This photo was made March 6, 2008, after the lecture on “The Battle for the Integrity of the Bible” at Faulkner University. Photo by Leon Mauldin. If you would like to learn a little about the background of this unique man we suggest his 2012 autobiography, As I Remember It. I appreciate very much the kind things you had to say. I am trying to get finished the work on the twelve prophets I started more than twenty years ago. I am a great one at starting, but less successful in finishing. I will look forward to seeing you in Boston in November [at the annual professional meetings]. Sincerely, Jack P. Lewis. This entry was posted in Archaeology, Bible Lands, Bible Places, Bible Study, Biblical Studies, Books, New Testament, Old Testament, Photography, Travel. Bookmark the permalink. Thank You, Bro Jenkins for sharing your experiences with Dr Lewis. Just in case you did not know, on the Germantown Church of Christ, a video of the Memorial service is posted on their homepage. Even though I only had him for one class, he influenced me greatly. While other men were on a first name basis, I could never call him anything but Dr Lewis. I was in awe of the man even before I met him. One of my teachers at Bear Valley, Dan Owen, told us stories about Dr Lewis’ class. When got to the Grad School and took Dr Lewis’s class, I discovered the stories were true. He really did start his lecture out in the hallway as he was entering the classroom. He wanted to take advantage of every second to teach us the Old Testament. I tried to audit his Hebrew class, but I had to drop after three weeks. If I was going to be in class, I had to do all the homework and participate in class. One big disappointment was not being able to take a summer class by Dr Lewis on the Minor Prophets. The School required at least four people sign up for the class and we were short. Very sad that there was no interest by the rest of students. It would have been a killer in the summer session, but it would have been worth it to me. Thank you, Dr Lewis, for inspiring us to learn even more of God’s word. I appreciate your comments regarding Bro. Lewis. As taught by Bro. Lewis, preachers and teachers would be very wise to consult and use primary sources.